Elite Dangerous and Star Citizen have started something off here, and it is good. 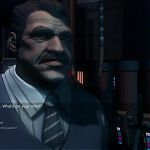 Rebel Galaxy may not be as technically involved as either of these two games but it manages to stand out on its own two feet. Imagine if you will crossing Borderlands with Firefly, adding a little bit of Assassins Creed Black Flag, and your somewhere near to Rebel Galaxy. One issue with Elite Dangerous is that you’re unable to fly anything truly massive. With Rebel Galaxy that will never, ever be an issue. The game opens with you arriving on an outer rim galaxy, and the reason why you got dragged to this godforsaken backwater. You receive a message from Orzu, a local character who know the whereabouts of your Aunt, asking you to meet at a local station. Upon arrival at the station’s bar, Orzu introduces himself and asks a few favours from you and you’re offered your first missions. 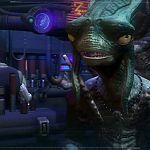 The first few introduce you to both travelling through the vast environments, as well as a gentle introduction to combat – gently pushing the story on to venture further around the galaxy. 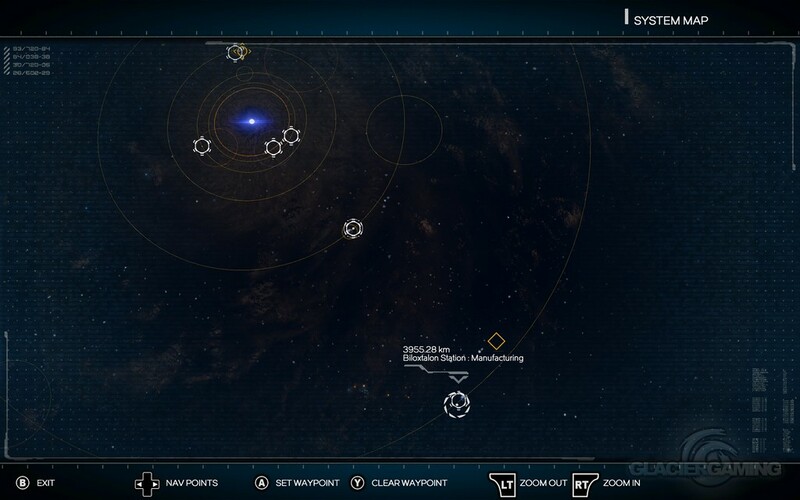 These inaugural missions introduce you to the main core of the games ecosystems – trading, combat and mining. 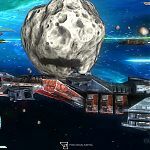 It’s a gentle introduction to the game and, similar to other space exploration games, you’ll eventually get sidetracked by a few missions and the minutes will melt away into hours. 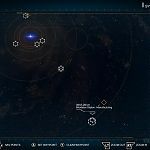 Missions handily have a guide to how tough they are, although you may want to wait until you’ve upgraded before attempting some of the missions. Travelling around the universe is simple enough, pressing the A button sets your speed in 25% increments, and when you are clear of any larger objects, you automatically move to sub-light speed. Hitting A again whilst in sub-light speed moves you to warp – allowing you to travel the longer distances through the open world. As soon as you move close to a larger obstacle when travelling at warp, your engines will cut and you’ll be reduced down to normal travelling speed. At first this is nice enough, as it stops you from crashing in to any large obstacles, but after a while being taken out of warp when you’re trying to get somewhere quickly can get a little annoying. You have no warning when this will happen, the radar or map won’t show large celestial objects, and you have no time to allow yourself to move to another course. Combat may take a while to understand, but is brilliantly fun. Your ship has 4 shields. Front, aft, port and starboard. Taking too much damage on one side eliminates your shields and allows your enemies to penetrate your armour, damaging your ship in the process. Damage is in real time and gives you an indication as to how much punishment you can take. Keeping on the move in combat is vital – allowing your fully shielded side to take further punishment, while you let you damaged shields recharge keeps you on your toes and brings an element of strategy to combat. 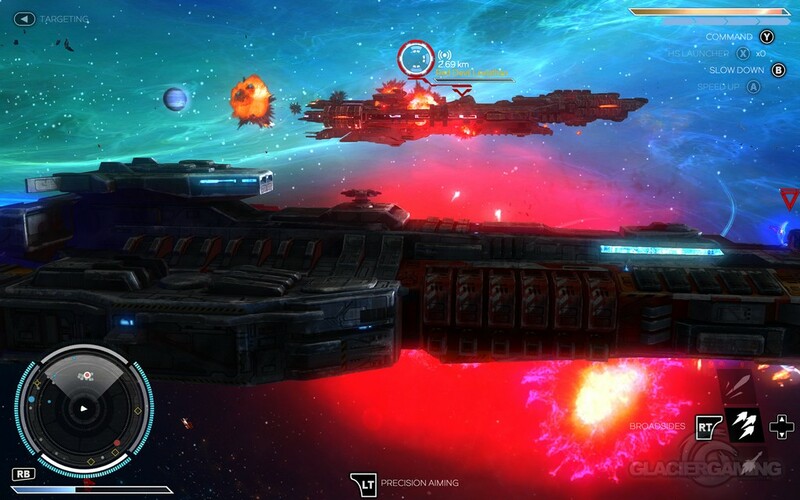 Your broadside cannons are your heavy-hitters and are aimed by holding the left trigger down. The longer it’s held the more accurate your shots become. The cannons can only be fired in an accurate barrage in precision mode, but a precise volley can decimate the shields of larger targets. 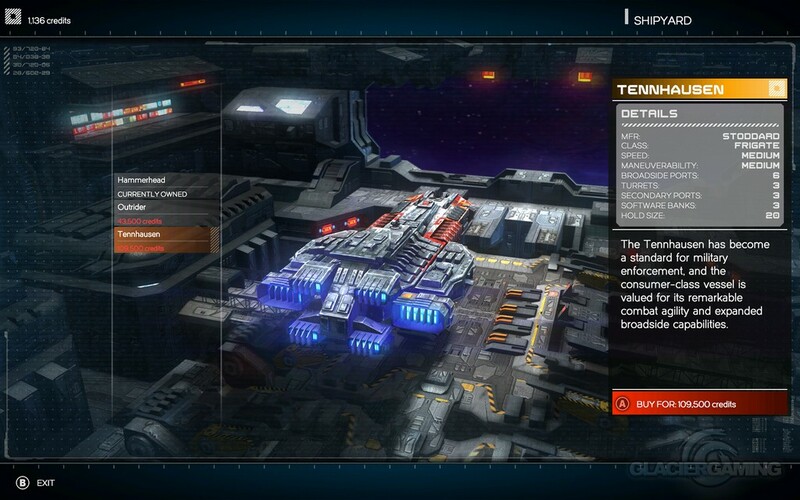 Add in the turrets on your ship, and you have some real tactical options at your disposal. 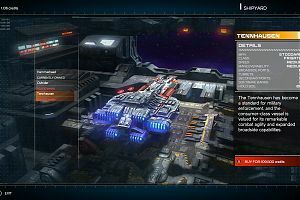 It may not seem like it at first, but when you do finally get that new ship, with the extra turret space and the variety of turrets available, the tactical possibilities really start to open themselves up. Each turret can be controlled individually, and can be aimed at specific targets or just let them free reign over the closet enemy. 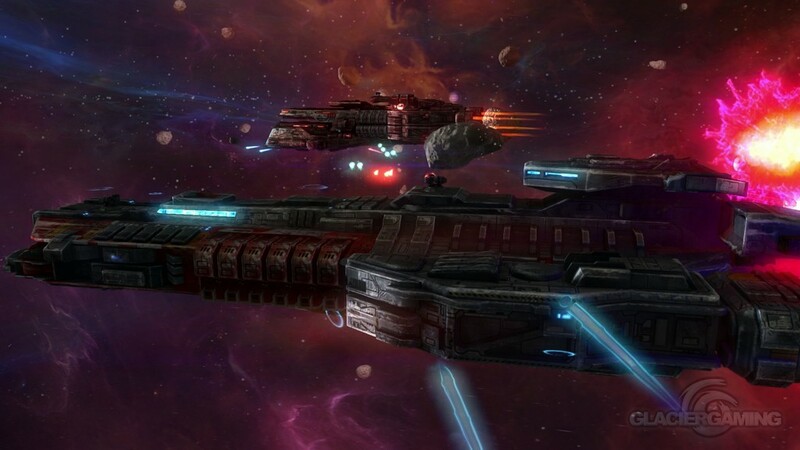 This becomes more relevant when you leave for another system, and the enemies increase in each battle – having that amount of control over each turret adds just a little bit more depth to the combat. You can hire a mercenary from each station to fly along with you through out the galaxy. 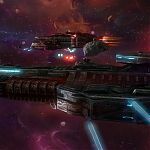 Each one has a different ship loaded with various weapons and the extra firepower, which comes in handy – especially when you have the larger, slower moving craft. Having a quicker, more agile fighter helping you in combat can quickly whittle down the number of enemies you face on each encounter. Although the game always stays on a horizontal plane and never moves fully in to the realm complete aerial control, combat never gets old. It feel as if this worked in the games favour for having less control over your ship. 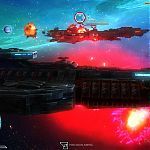 With the various types of enemies attacking you, learning when to boost out of trouble, and when to take damage becomes essential to your survival in the hostile world of Rebel Galaxy. The world has a nice mix of space stations – made to feel like they are there for a purpose, and although the world can feel empty, it is bright and colourful throughout. Reds, blues, pinks and purples fill the world up and it’s beautiful to look at. It may seem empty at first, but the odd distress beacon here, and a random enemy encounter there fill the world with much to do. 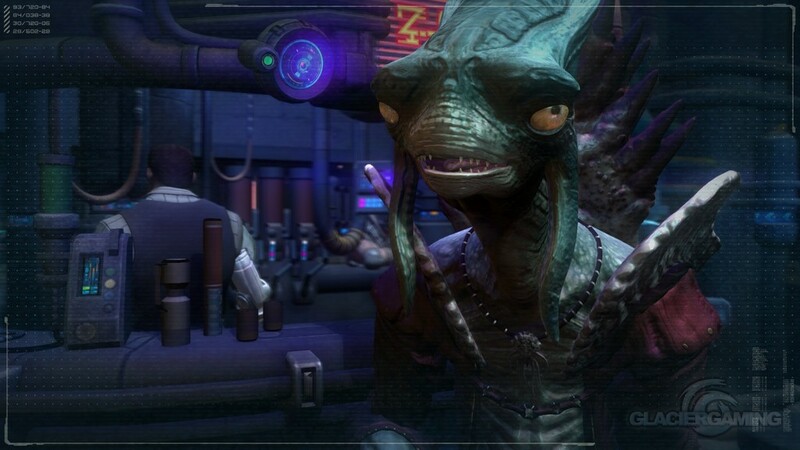 As you work your ship through the early parts of the game, earning credits and buying new items to eventually upgrade- things can get a little tough. You’ll find yourself running around the galaxy doing missions just your upgrade your gear, and again this never really gets old. It’s a simple system and keeps you playing just to get that elusive upgrade. 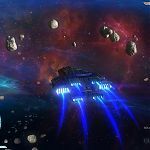 When I first started playing Rebel Galaxy I didn’t know that it was created by a team of two people, albeit with over 30 years of experience between them. The game has very few bugs, has a great, if somewhat repetitive, soundtrack (the background music in game should have remained instrumental in my opinion). 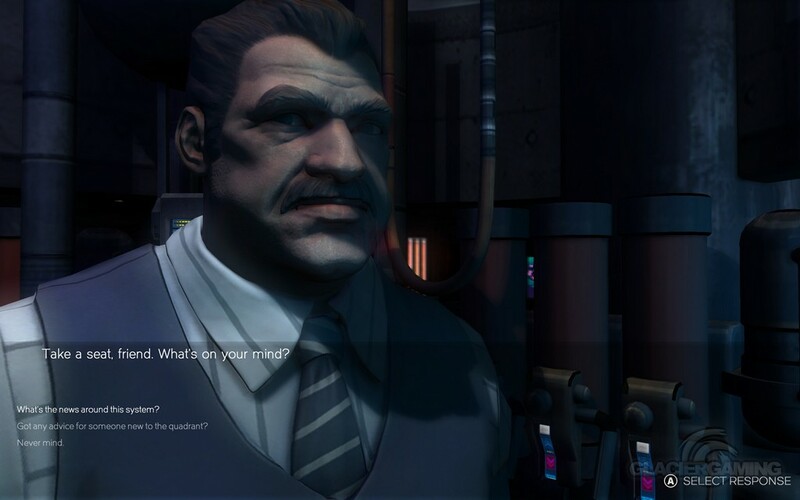 A few of the textures are a little flat on the some of the characters (I’m looking at you, furry guy! ), and travelling around eventually can start to feel a little like a chore in the latter part of the game. 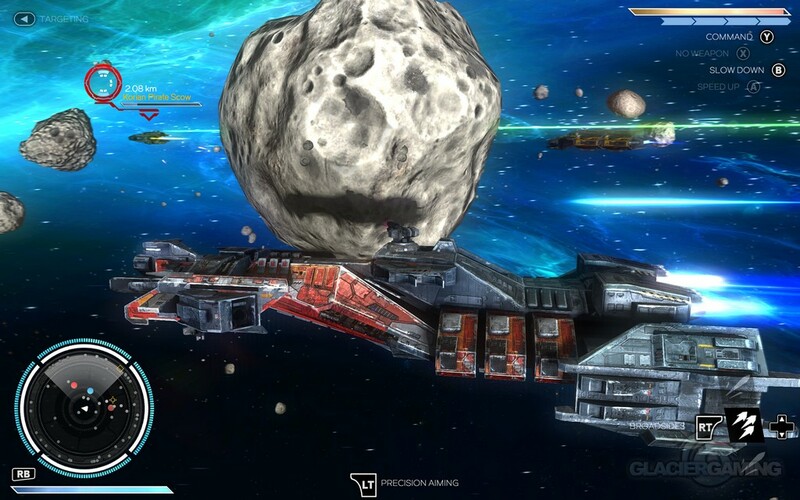 Overall, I loved Rebel Galaxy. For anyone who is looking for a entry level game, and are too afraid to look into Elite Dangerous, it is a marvelous game. A world filled with bright characters, a story to chase along at your own pace, and a world where you carve your own reputation between the many many factions. 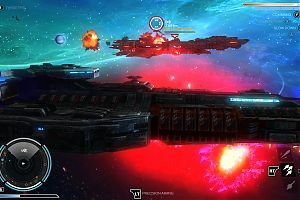 Rebel Galaxy is a fine example to the genre. Much less simulation, and much more arcade. 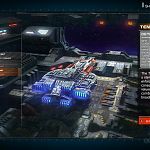 Rebel Galaxy has enough to not only stand on its own two feet but bring its own ideas to the space simulation on consoles. 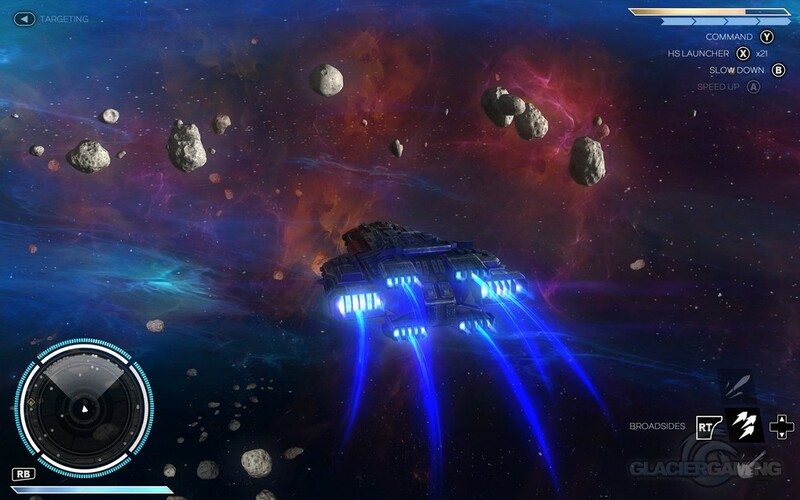 This review is based on playing the Xbox One version of Rebel Galaxy .